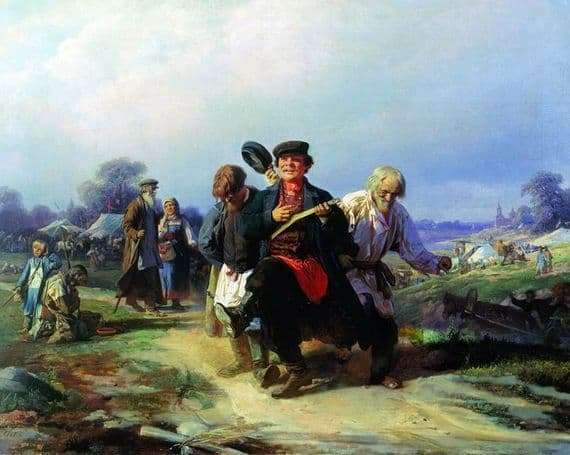 The works of the peredvizhniki by A. Korzukhin’s painting “Returning from the Fair”, painted in oil on canvas in 1868, are close in spirit. However, the technique of execution of this work compares favorably with the paintings of other masters of the brush, dedicated to scenes of people’s life. Alexey Korzukhin not only portrayed a household episode, but clearly worked out the composition of the picture, the main content of which was the truthful display of reality. The author with the help of paints conveys the bright sides of human souls, penetrating sympathy towards the people. The painter conveys the mood of the common people expressively and versatile. The simple picture of the return of people from the fair was written by the author very lyrically, sincerely and naturally. It evokes rather quivering feelings and delight in the viewer. Looking at it, you unwittingly feel like a participant in the action. Together with cheerful and satisfied characters, you come back on the dusty road from the fair, watch how they enjoy shopping, like children, dance to the amazing sounds of balalaika, enjoy the aroma of fresh air and admire the beauty of the bottomless sky blue. Giving us this masterpiece of art, Korzukhin once again assured everyone that he was a good observer. On this amazing canvas, the well-known artist very accurately and delicately draws the festive mood of an ordinary fair day, conveys joy and fun in the eyes of people with a brush on canvas. This picture of Korzukhin has a deep meaning, because the artist wants to show the viewer how, despite the difficulties of being, the cheerful Russian people manage to have fun. This is the true purpose of the artist – to depict fun, delight, lyrical mood, sincerely penetrating the love of his native people. So the title of academician for the painting “Return from the Fair” master brush deservedly awarded.